Chief Minister Prof. Prem Kumar Dhumal received and welcomed the Rashtriya Ekta Yatra on behalf of the people of the State at Mehatpur in Una district today. The Yatra launched by Bharatiya Janta Yuva Morcha (BJYM) was led by National President, BJYM. Chief Minister said that the youth of the State had made supreme sacrifice since 52 youth attained martyrdom during Operation Vijay in Kargil. He said that their sacrifices had not gone in vain as they flush infiltrators out of Indian territory. He said that it was unfortunate that UPA partner Government in Jammu and Kashmir was against unfurling of National flag in Jammu and Kashmir. He said that J&K is integral part of India and unfurling national flag was the legitimate right of citizens of the country. 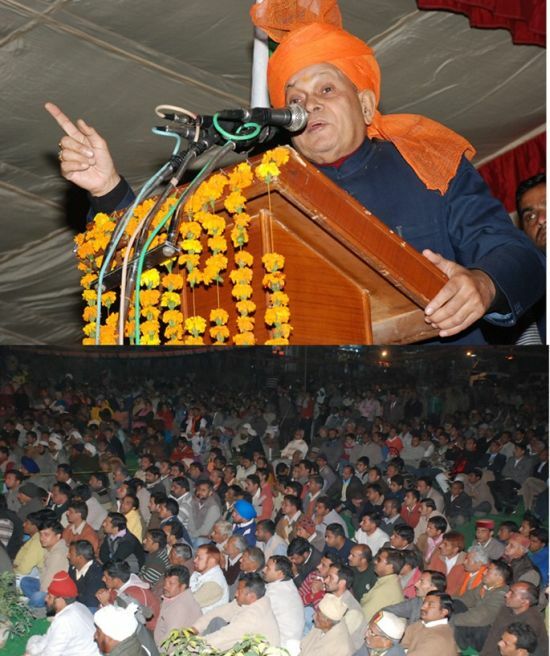 Prof. Dhumal gave a clarion call to every youth to join the Yatra. He said that BJP would not allow disintegration of the country. He appreciated and supported the cause of BJYM and said that every citizen of country supports the Ekta Yatra. He wished Yatra a grand success. 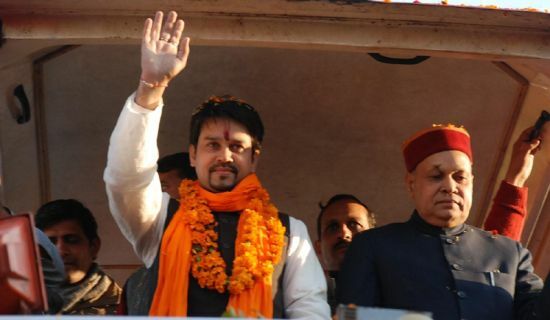 Anurag Thakur, National President BJYM and Member of Parliament thanked the people, especially the youth of the country for supporting Ekta Yatra overwhelmingly. He ridiculed the divisive forces who were bent upon disintegrating the nation for their ulterior motives. He said that J&K was part and parcel of the country and unfurling the national flag was birth right of every Indian. He said that the motive of separatists, who were attempting to keep Jammu and Kashmir as separate identity would not be fulfilled as they are not well wishers and true citizens of the country. Shri Thakur said that law and order was deteriorating in the country due to maladministration of UPA Government at the Centre. He said that BJYM was committed to realize the dream of great thinker late Shri Shyama Prasad Mukherjee to integrate the nation. 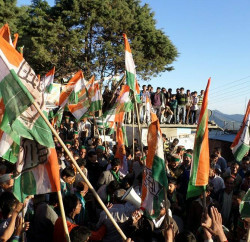 He thanked the people of the country who were welcoming the Yatra. 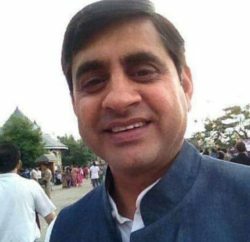 Shri Thakur reiterated the resolve of the youth to unfurling the national flag and Lal Chowk, Srinagar. He said that Yatra had passed through 25 States covering 2700 kms and organizing 376 meetings where people in large number welcomed the Ekta Yatra which is a symbol of national unity against anti national elements. He challenged the move of UPA Government to give autonomy to State of Jammu and Kashmir which was not in the interest of united India. 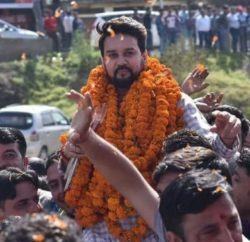 He said that 11,000 youth of the State would be accompanying the Yatra to Lal Chowk and said that the Yatra is getting big support from all sections of the society.